Wye Oak, for­mer­ly Monarch, released its sec­ond album Tues­day under the Merge label. The band, named after its home state of Maryland’s hon­orary state tree, car­ries its indie-folk sound clean­ly and dis­tinct­ly, but the album itself is heav­i­ly opi­ate. The hyp­not­ic qual­i­ty of the sound affects the entire album, forc­ing what might oth­er­wise have been an above-aver­age album down a great num­ber of points. Indi­vid­u­al­ly, the instru­ment lines on The Knot are mid­dling at best. While the drums, gui­tar, or key­board occa­sion­al­ly dip out of medi­oc­rity for an inter­est­ing few sec­onds, such as in the nice­ly con­trast­ing sec­tion around the two minute mark in “I Want for Noth­ing,” or the build­ing begin­ning of “Tat­too,” and the parts are gen­er­al­ly well played, they are char­ac­ter­ized by sim­ple, high­ly repet­i­tive sec­tions. After “Tat­too“ ‘s intro­duc­tion, the track los­es any sort of direc­tion entire­ly until it abrupt­ly tran­si­tions to a sec­ond, equal­ly motion­less sec­tion. It then moves back and forth a few more times until the remain­ing four min­utes have elapsed. Both Andy Stack and Jenn Was­ner con­tribute vocals to The Knot, though this col­lab­o­ra­tion doesn’t lend much vari­a­tion to the album, as Stack’s vocals lead clear­ly on only the first track. After “Milk on Hon­ey,” on which Stack is pro­fi­cient but not espe­cial­ly inter­est­ing, Was­ner takes up lead vocal duties for the remain­der of The Knot. It’s at this point that the album moves from unin­ter­est­ing to utter­ly soporif­ic. In cre­at­ing a mediocre copy of the voic­es of every oth­er singer in the genre, Was­ner seems to have per­fect­ed instead the art of the drone, slip­ping along her vocal scale while slur­ring the lyrics them­selves, mak­ing them large­ly incom­pre­hen­si­ble, and fill­ing The Knot with inof­fen­sive and utter­ly monot­o­nous noise. Those lyrics that aren’t obscured by Wasner’s blurred singing are about as excit­ing as the rest of the music - gener­ic to the point that “cliché” would seem a com­ple­ment. It’s also fair­ly clear that these lines don’t stand out because they’re espe­cial­ly good but sim­ply because of where in the music they are placed; the fact that, for exam­ple, “You either win it / Or you don’t” is one of very few entire­ly audi­ble lines on “For Prayer” isn’t entire­ly attrib­ut­able to bad taste on the part of Wye Oak, but luck on the part of the line - or bad luck on the part of the lis­ten­er. One of a very small set of lyri­cal suc­cess­es on The Knot is “Take It In,” a song which, rather fit­ting­ly on such a sleep-induc­ing album, focus­es on sleep­ing. Phras­es such as “Half the day awake / Half again asleep,” which dis­play a poet­ic apti­tude utter­ly absent (or per­haps inaudi­ble) on the rest of the album, dis­tin­guish the track as the most inter­est­ing on the album (though it cer­tain­ly still suf­fers from many of the issues of the album as a whole), leav­ing us won­der­ing why the rest of The Knot couldn’t at least have met that low stan­dard. 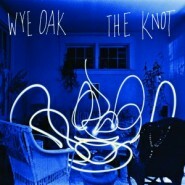 The Knot is not a bad album, at least in tech­ni­cal terms. Stack and Was­ner seem to know what they’re doing on at least a fun­da­men­tal lev­el. Instead, the main prob­lem with The Knot is a com­plete lack of ener­gy through­out the album. Even the most over­ly loud sec­tions of “For Prayer” can’t drag the album out of its tran­quil mood, to the point where it’s hard to dis­tin­guish parts of the album apart, except, per­haps, by the lev­el of sleep they induce. If Wye Oak’s goal was the cre­ation of an effec­tive sleep aid, this would be a suc­cess, but as an album it’s intense­ly bor­ing, and that’s the only inten­si­ty that The Knot even approach­es.